One of the standout pitchers in the long history of the Lowell High School Baseball program, Roland Roy was once named by Hall of Fame Coach Stan Stoklosa as one of the top hurlers of his tenure at the helm of the Red and Gray. 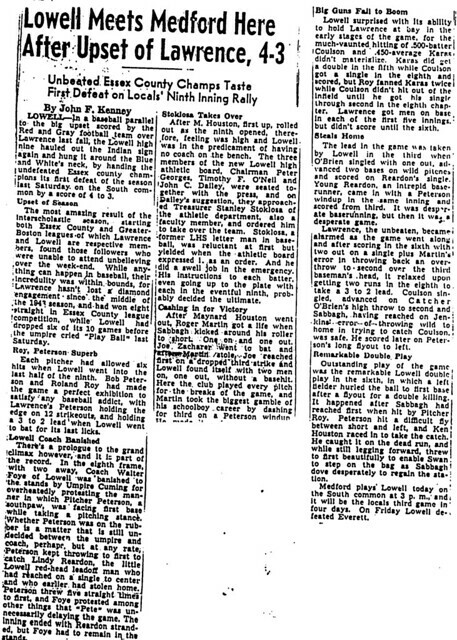 The mainstay of the Lowell High pitching staff during his sophomore, junior, and senior years (1943–1945), Roland was a fixture on the mound. 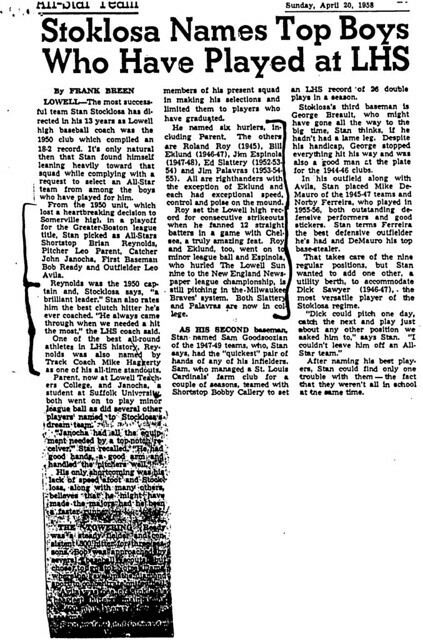 He appeared in no fewer than 25 of the Red and Gray’s 44 games during that time, gaining credit for 10 of Lowell’s total of 15 victories. Additionally, Roland led Lowell in games pitched, innings pitched, victories, and strikeouts during each of those three seasons. 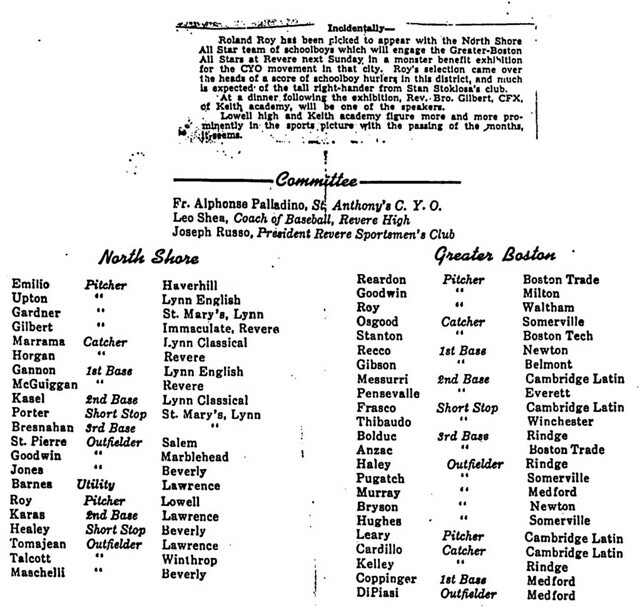 His name appears on the all-time Lowell High School lists in each of those categories. 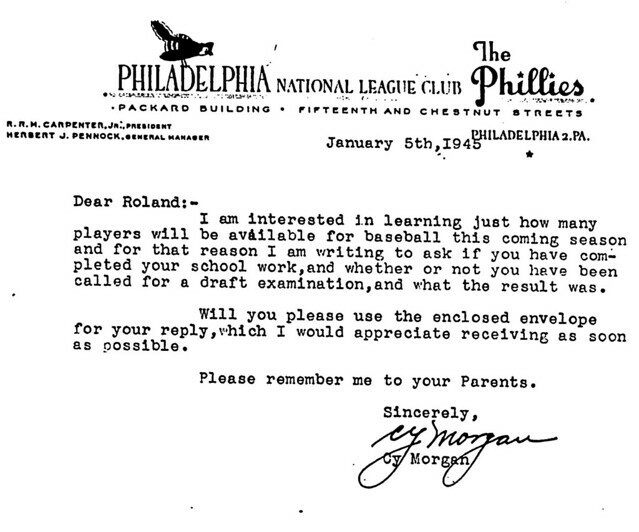 During a career that spanned 163 2/3 innings Roland recorded 166 strikeouts, more than one per inning. Roland made an impressive debut for the Red and Gray as a sophomore, shutting out Chelsea on three hits while striking out 11 batters in a 3–0 victory. It was a precursor of things to come. 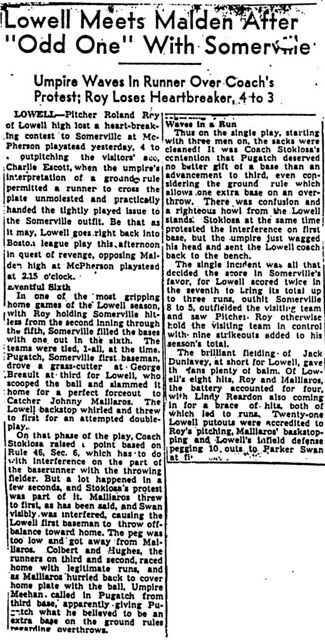 The highlight of Roland’s junior season (1944) occurred as Lowell, carrying a 4–6 record at the time, stunned previously undefeated (8–0) Lawrence 4–3. 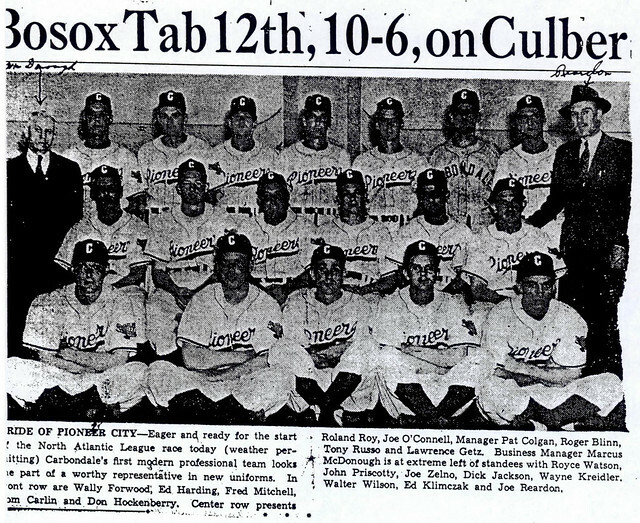 Facing a vaunted Lancer lineup that had not tasted defeat since the midpoint of the 1943 season, Roland spun his magic, scattering 6 hits in a win that surprised baseball pundits throughout the area. Roland’s efforts as a senior stand out. In one of the most outstanding pitching performances in the 125-year history of Lowell High Baseball, Roland struck out 20 batters, including 11 in a row at one stretch, as Lowell defeated Chelsea 12–5. The twenty K’s broke the old LHS record of 19 set in 1910. Roland’s record stood until 1958. 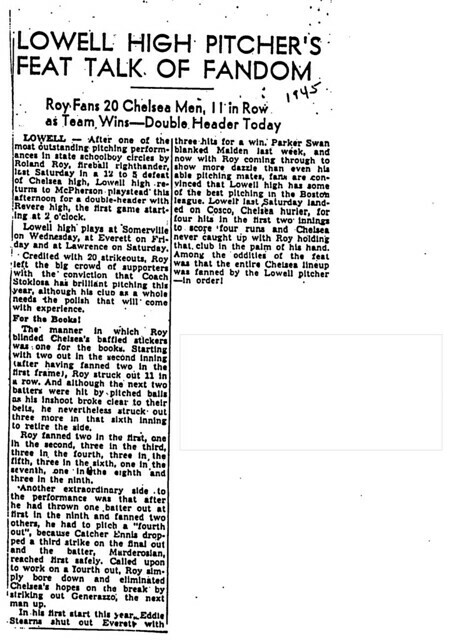 In an epic battle against Keith Academy and its legendary pitcher Jack Campbell, Roland struck out 11 and added 2 hits as Lowell edged its intracity rival 5–3 before over 500 spectators at McPherson Playground. 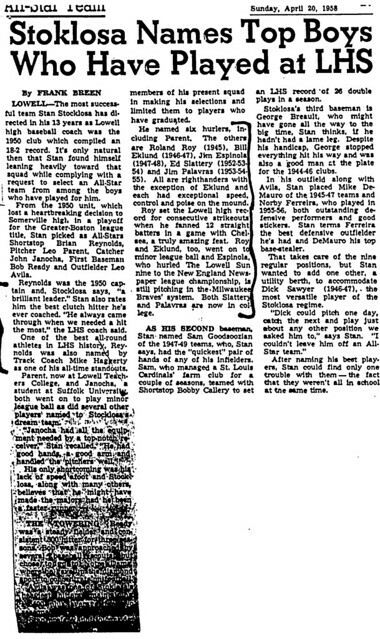 At the conclusion of his senior season, Roland was selected as the only Greater-Lowell area member of the North Shore All-Stars in a post-season contest against the Greater-Boston All-Stars. 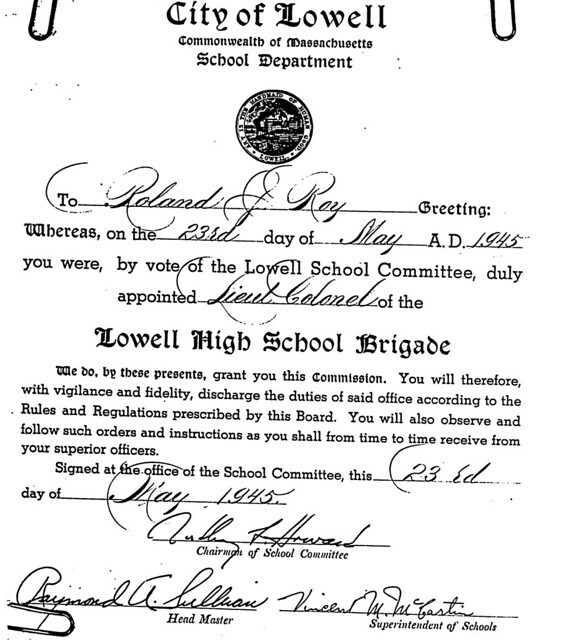 After graduation, Roland entered the military. 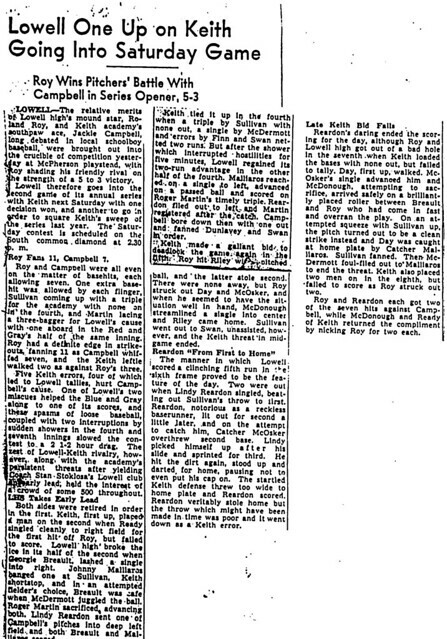 Upon his discharge, he played minor league baseball with the Baltimore Orioles, after also having been contacted by the Philadelphia Phillies. 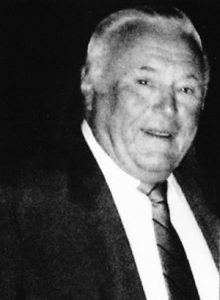 LOWELL — Roland J. Roy, 87, of Lowell, died Thursday, May 22, 2014 surrounded by his family. He was the beloved husband of the late Jeannine T. (Lippe) Roy, with whom he celebrated 61 years of marriage on November 3, 2011. Born in Lowell on November 15, 1926, he was a son of the late Timothy and Blanche (Lozeau) Roy. Roland was a licensed insurance agent and real estate broker and in 1959, along with his wife, started the Roy Insurance Agency in Lowell. 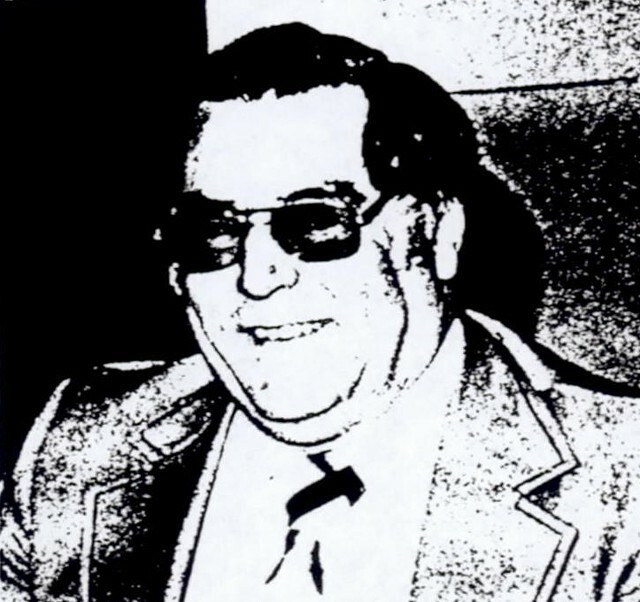 Following his retirement in 1995, he began spending his winters at his residence in Deltona, Florida and enjoying summers at his home on Lake Winnipesaukee in NH.Roland attended Ste. Jeanne d’Arc School and was a 1945 graduate of Lowell High School, where he excelled in baseball. 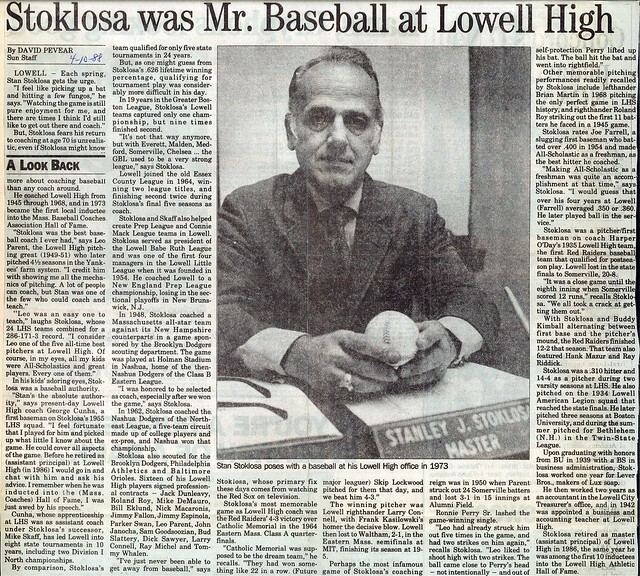 He was later inducted into the Lowell High School Hall of Fame. 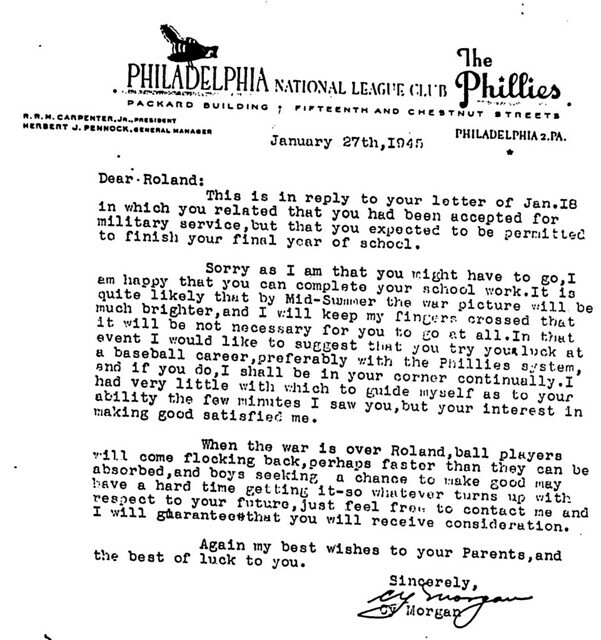 Upon graduation, Roland entered the US Army until the completion of WWII. He signed a professional baseball contract with the former St. Louis Browns and played one season with their AA affiliate in Carbondale, PA until he married Jeannine and returned to Lowell. Roland was an avid sports fan, a lifelong member of the Lowell YMCA, and a communicant of St. Francis Parish. Survivors include a daughter, Denise (Roy) Welch and her husband, Michael of Tewksbury; three sons, Ronald Roy and his wife, Mary (Rick) of Conroe, TX, Richard Roy and his companion, Kathy Crowley of Dracut, Robert Roy and his wife, Wendy (Entwistle) of Pelham, NH; eight grandchildren, Jason, Trista, Heather, Jessica, Michael, Nicole, Emily and Renee; five great-grandchildren, Staciabella, Hayden, Adrianna, Ella and Gavin.